THUMBS DOWN: We paid $233.16 for a room with two queen-size beds at the Best Western Bidarka Inn on Sterling Highway in Homer, Alaska, on Aug. 10. I'm not sure why this roadside motel is named after a bidarka, a canoe covered by animal skins like those used by Native Alaskans. THUMBS DOWN: One of the electric radiators in our room was broken, the beds were much too soft, the floor sloped and the TV remote barely worked. 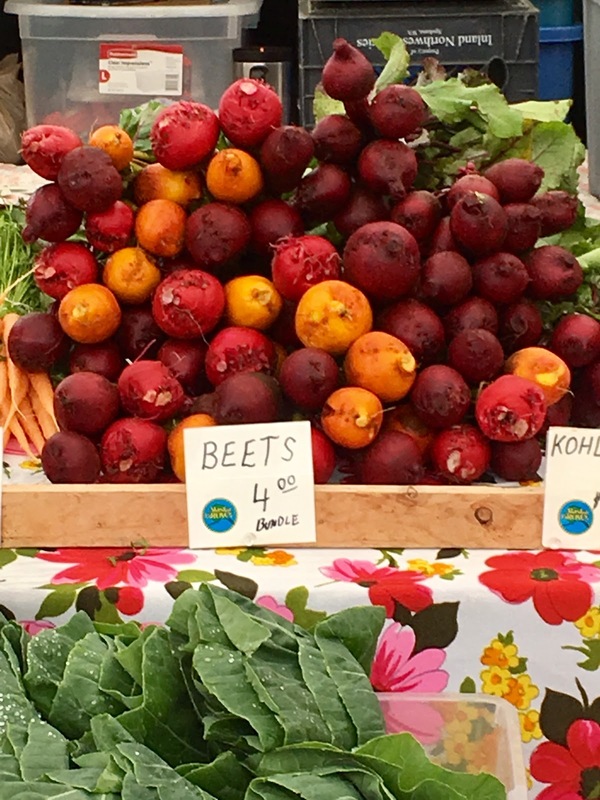 HACKENSACK, N.J. -- Even if you don't want to fish for halibut, Homer, Alaska, offers a colorful farmers market, a nature center, scenic drives and four volcanoes across the bay. But if you stay overnight, as we did on our vacation last month, the Best Western Bidarka Inn is far from the best choice. In fact, the place is little more than a roadside motel with a faux log-cabin exterior and the worst complimentary breakfast I've ever had. Our room had two electric radiators, but the smaller one in the bathroom didn't work. The two queen beds were much too soft, and the floor between them sloped down toward the wall. The TV remote barely worked, and buttons had to be pushed two or three times to change a channel or perform another function. As if that wasn't bad enough, the next day's free buffet breakfast didn't offer cut-up fresh fruit, nuts or raisins for the granola or egg whites for the mediocre made-to-order omelet, and the coffee was dispensed by a machine. THUMBS UP: The Homer Farmers Market operates on Saturdays and Wednesdays until Sept. 30, and reopens next May. 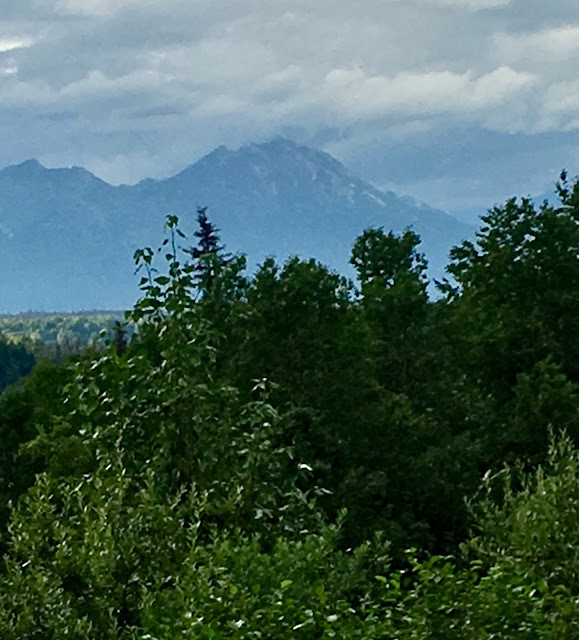 We drove a rental car 225 miles to Homer from Anchorage, mostly on two-lane roads clogged with motor homes and other recreational vehicles, arriving in early afternoon. I loved my lunch special of the day at Cosmic Kitchen, a juicy Thai Wild Salmon Slider and Blackened Rockfish Slider, served with Sweet Potato Fries and Coleslaw ($10.25). But my wife complained her Seafood Ramen Bowl ($14.29), though tasty, had hardly any broth. The tables were turned at dinner at Pho & Thai Restaurant, where she enjoyed a bowl of Vietnamese Pho Combo ($12.50), but I hated my Pad Thai ($10), which was made with the wrong noodles and overcooked, dry tofu. I was hoping to order wild Alaskan shrimp, but the restaurant served only low-quality farmed shrimp from Thailand. We finally agreed over lunch the next day at Happy Face, a Korean-owned restaurant on the 4.5-mile-long Homer Spit with a menu of sushi, fresh seafood, Chinese and Korean food. I liked my battered-dipped, deep-fried fresh Halibut with French Fries ($19.95), and she loved her stone-bowl Bibimbap, a Korean comfort dish of rice, shredded vegetables and beef, topped with a fried egg (also $19.95). THUMBS UP: The deep-fried fresh Halibut at Happy Face Restaurant in Homer, Alaska, called the Halibut Fishing Capital of the World. Gochujang, a Korean red chili paste, was available for the fries. THUMBS UP: The Dolsot Bibimbap at Happy Face Restaurant was everything this Korean comfort dish is supposed to be and more. THUMBS DOWN: The spicy cabbage kimchi was some of the best we've ever had, but Happy Face Restaurant charges $4.95 for a small bowl, and doesn't offer seconds at no charge, as does every other Korean restaurant I've patronized in the past 20 years. HIT AND MISS: I enjoyed this Seared Alaskan Halibut with Warm Crab Salad and Vine-Ripe Heirloom Tomatoes ($41) in the Gold Rush Restaurant at the Denali Park Village Hotel. But my wife found her Red King Crab Legs to be much too salty ($39). With two a la carte salads, a soda and a 15% tip, our dinner totaled $118.50. Each glass-dome railcar on the Gray Line Alaska tour to Denali National Park from Anchorage has a bartender, tables in front of every seat have brackets to hold your smartphone or tablet, and there are outlets to charge those devices. But there is no Wi-Fi on any train or tourist bus, so if you try to post on Instagram and other social media or just want to connect to the Internet, it's hit or miss -- mostly miss. You also won't find any Wi-Fi on board the high-speed catamaran used for the 26 Glacier Cruise with Phillips Cruises & Tours from Whittier, Alaska. Adults pay $178.95 each, including a light lunch, but if you choose the Salmon Chowder, you'll find it's thickened with too much corn starch. Narration is by the captain and a Chugach National Forest ranger, and you'll definitely need a warm jacket, if you go out on deck to take photos. "Bear tracks are tracks with no train on them" and "Silent dogwoods have no bark." In Anchorage, we somehow missed the money saving Alaska Culture Pass, a total of $32 for admission to the Anchorage Museum and Alaska Native Heritage Center, plus a free shuttle that operates 7 days a week from May to September. On our Gray Line tour, we stayed at the Denali Princess Wilderness Lodge and the Mount McKinley Princess Wilderness Lodge, two luxury hotels owned by Princess Cruises, but we found the rooms and food service weren't consistent. We were supposed to stay at the lodge outside Denali National Park and Preserve for 2 nights, but at the last moment, Gray Line demoted us to the Denali Park Village, a less desirable hotel where the power was out when we arrived and stayed out for more than 2 hours, delaying dinner service in the restaurant. I called the Denali Princess Lodge and managed to get a large, king-bedded room and bathroom with a walk-in shower for the 2nd night. The following night, our smaller room at the McKinley lodge had a cramped, motel-like bathroom, with a discolored shower curtain and one of those one-piece plastic makeovers for the bathtub/shower that was starting to chip. BIG HIT: I've never been a big fan of cauliflower, but one of the best dishes I had on our 15-day vacation was this starter of Roasted Cauliflower with Yogurt, Feta, Mint and Toasted Sesame Seeds ($9) in the North Fork Dining Room of the Mt. McKinley Princess Wilderness Lodge. Our entrees were Crab-Stuffed Halibut with Cheddar Chive Mashed Potatoes ($45) and Short Rib Pappardelle ($28), we drank 3 glasses of red wine and our bill totaled $123.50, including a 20% tip. BIG MISS: At the Denali Princess Wilderness Lodge, we paid $17.99 each for an awful buffet breakfast, especially if you don't eat Reindeer Sausage and Hickory Smoked Bacon. No egg whites were available, and premium berries were missing from the fruit salad. For some crazy reason, the breakfast is served in a darkened hall used as a music theater in the evening. ANOTHER BIG MISS: After that disappointing buffet breakfast at the Denali Princess, we decided to have an a la carte breakfast the next morning in the North Fork Dining Room of the Mt. McKinley Princess Lodge. But my Smoked Salmon Benedict, above, skimped on the smoked wild salmon lox and the English muffin wasn't even toasted ($14.99). BIG HIT: If you want to see this caribou and a wide variety of other wildlife in Denali National Park and Preserve, book the Tundra Wilderness Tour, an 8-hour guided bus ride, with frequent stops, that operates from June 1 to Sept. 13 ($173.20 for adults from the Denali Park Village Hotel, including a snack box and water). ELUSIVE DENALI: The highest peak in North America, Denali usually has its head in the clouds, but one day we saw the mountain from the deck of the Mt. McKinley Princess Wilderness Lodge -- 43 miles away. Denali's original name was Mt. McKinley. 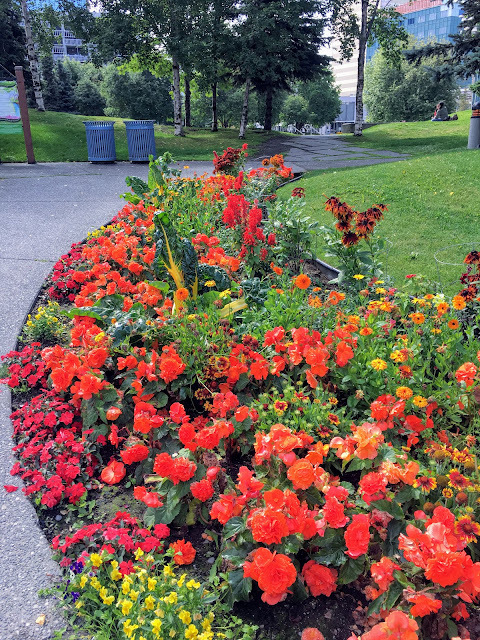 SPLASHES OF BEAUTY: We saw beautiful wildflowers in Anchorage, above, and just about everywhere else we traveled in Alaska during our vacation Aug. 1-15, including the Mt. McKinley Princess Wilderness Lodge, below. We found seeds to take home to New Jersey at Grizzly's Gifts on Fourth Avenue in Anchorage. We didn't think much of the guest workers from Eastern Europe, Asia and other parts of the United States we saw working at the Denali Park Village Hotel and the Princess Wilderness Lodges. After all, foreign guest workers have been a fixture on the Jersey shore for decades. But when I got home, I read that Alaska, at 7.1%, has the highest unemployment rate in the nation, so why weren't Alaskans hired for these jobs during the 4-month tourist season (May to September)? Hanan, our server for dinner in the King Salmon Restaurant at the Denali Princess Wilderness Lodge, volunteered she was an Arab-American woman from Florida. But she spoke almost robotically, and tried to upsell me to a more expensive glass of red wine, claiming it would "pair better" with the food I ordered. However, when she agreed to split two entrees, Asiago and Pine Nut Linguine ($25.50) and Sea Salt King Salmon over risotto ($49.50), she didn't mention surcharges I saw on the check later. About those guest workers. We were told by our American driver-guide on the Tundra Wilderness Tour that a doctor from Bulgaria was washing tour buses for $20 an hour. His American co-workers said he probably won't be returning next year, but the guest worker said he intends to return, because he was being paid more in Alaska than he is as a doctor in Bulgaria. As someone who eats only seafood, I soon got used to paying more than $40 for a fillet of Halibut or wild King Salmon in a fine-dining restaurant in Alaska, where those fish are caught. A Connecticut tourist we met on a train suggested that restaurants and other businesses charge as much as they can during the abbreviated, 4-month tourist season. Unless you're a really big eater, skip Bridge Seafood Restaurant in Anchorage, where entrees are priced higher than at other fine-dining restaurants, because they include a free, all-you-can-eat salad bar. And don't be surprised when the "signature" or "famous" salmon spread at Bridge Seafood and other restaurants contains 95% cream cheese and hardly tastes of the state's greatest wild fish. The smoked seafood at Alaska Sausage and Seafood in Anchorage was another disappointment. We paid nearly $25 a pound for Kippered Halibut and nearly $24 a pound for smoked Salmon Strips, but I didn't read the ingredients label until I got home, and was shocked to see brown sugar, corn syrup solids, sodium lactate and sodium ascorbate had been added to the fish. AT THE RED CHAIR CAFE: The gluten-free Kale Bake Skillet ($15.50) at The Red Chair Cafe included asparagus, cremini mushrooms, grape tomato, zucchini, sliced almonds and a light mustard vinaigrette finished with aged white-cheddar cheese. A sprinkling of ground cumin or crushed red Aleppo pepper over the eggs would have added some needed eye appeal. ARTISTRY: The Red Chair Cafe is open from 7 a.m. to 3 p.m. Tuesdays through Sundays. If you're a fan of Korean food, steer clear of VIP Restaurant in a strip mall at 555 W. Northern Lights Boulevard in Anchorage, where we had the worst Soft Tofu Stew ever ($14.49 each). We liked our Veggie Omelets ($13 each) at the White Spot Cafe, 109 W. 4th Ave. in downtown Anchorage, but the place is so popular we had to sit at the counter and wait about 30 minutes for them. A better choice for breakfast is The Red Chair Cafe, if only to see the art-filled interior, but here, too, we had long waits for our food, and on two visits, I wasn't able to order the signature Tustumena Smokehouse Salmon Benedict, because they had run out of the "seared salmon bacon" ($15.75). On most mornings, we were happy with the free buffet breakfast at our hotel, Hyatt House in Anchorage -- fruit salad with premium berries; granola topped with slivered almonds, dried raisins and cranberries; an omelet of the day or a made-to-order omelet with or without egg whites; pancakes, premium teas and more. And when we were too tired to go out to dinner, we found some appealing dishes on the bar menu, and washed them down with wine or Alaskan beer on tap. 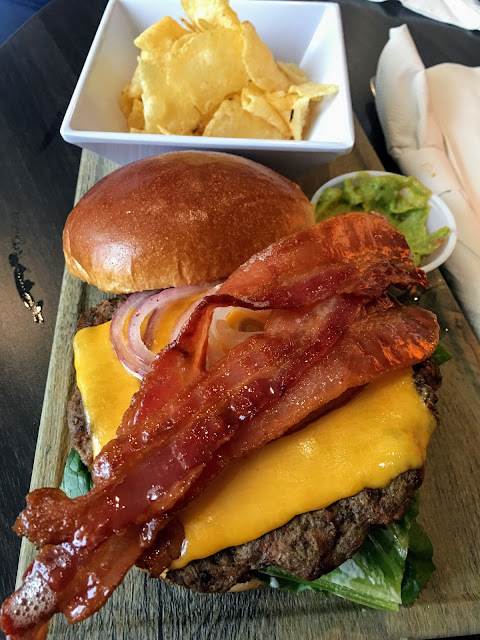 AT HYATT HOUSE: My wife was very happy with her grass-fed All-American Cheeseburger topped with hardwood-smoked bacon ($13.75) from the H Bar menu at Hyatt House in Anchorage. 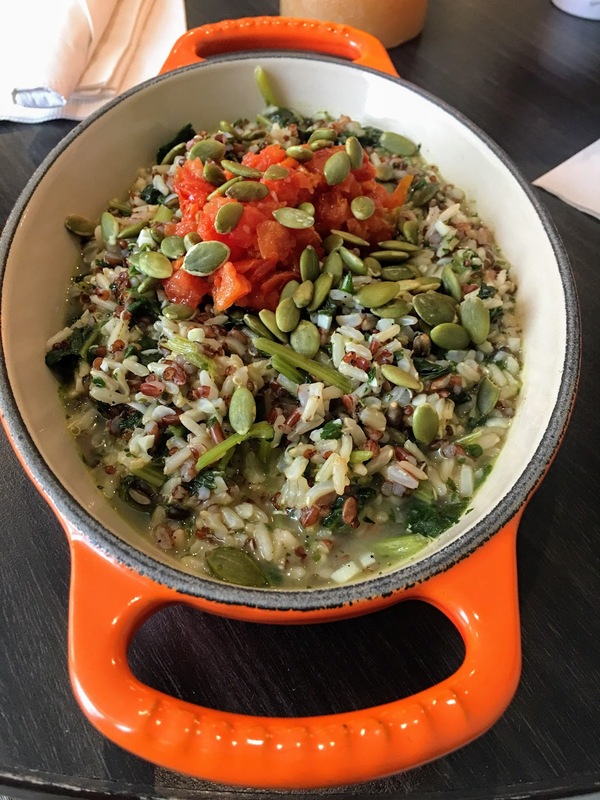 I chose the Mediterranean Bowl ($12.50), below, an ancient grain and kale blend with pumpkin seeds and an Italian herb vinaigrette, and asked the kitchen to hold the chicken.